What if punctured wheel of a stroller? At strollers with inflatable wheels will definitely have significant advantages and significant disadvantages, one of which - a puncture. This problem is quite common and unpleasant, and it always happens, unfortunately, at the wrong time! 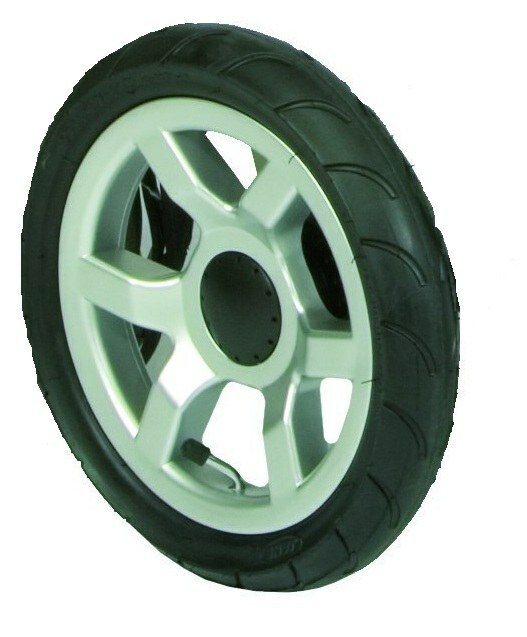 If punctured wheel strollers, where you need to go on any tire where you can fix or replace the wheel. You can also go to this issue in a sports store there too easily eliminate your problem. If the sports shop are selling bikes, then surely they are the wheels of the stroller can help because it often happens that a stroller purchased the tires and cameras, from children's bicycles. It is desirable, of course, not in a wheelchair with a punctured wheel, except that the nearest point of repair. You can still stick punctured the camera at home. Better doing that man, in a woman with a child and enough is enough. Take the problematic wheel, then remove the tire. Camera, immerse in a bowl of water and see where bubbles are coming - this is the puncture site. It can be glued, carefully put a patch from a small piece of the old camera. After you paste it into a strong glue, again, lower the camera into the water to make sure you fixed the camera quality. If punctures happen regularly, think about it, maybe you should change the tires, they tend to smachivaetsya. It is desirable, of course, to be careful and not to walk with the stroller on rough roads. Be sure to purchase a pump. But not Cycling, you will not be able to pump wheel, and a small foot pump car. But if you purchased a bike, buy him a hose for automotive pump. The fact that from time to time, the wheels of the stroller are blown away and need to pump, if it is always to go on the tire or in a sports store, so it is possible to be ruined, because, of course, all these services are chargeable. By the way, put the pump in the tray of the stroller and carry it with you for a walk, if the wheel is pierced, it is possible to pump in order to at least to the point of repair drop off the stroller with no problems. While the wheelchair is in repair, you can walk with your child, carrying him in a sling or backpack-carrying, it is also very convenient. Of course, the carriage of these innovations will not replace, but to sit at home while the wheelchair is in for repairs. The child needs to walk every day, so if you are an owner of stroller with inflatable wheels, postrequires and purchase a backpack carrier or sling, because no one is immune from the punctured wheel of the stroller. But the best puncture protection is a one-piece, light alloy wheel, Oh im sure nothing will happen!